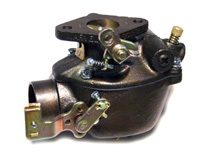 The Marvel Schebler TSX is a cast iron updraft carburetor that was used on many, if not most, makes of tractors, machinery and industrial equipment. Hundreds of different versions were made; our list of all available kits is here. TSX carburetors are identified by numbers on a riveted tag or cast into the body. In some cases, they are also marked with the equipment manufacturer's number. All TSX carburetors are of the same basic design, but differ in the size of casting, the flange size and shaft diamters. There are several different floats and arrangements of the main metering jet. In some carburetors the main jet is adjustable with a needle; in others it is fixed. Some carburetors come with a fuel shut off solenoid; these are designated with the suffix 'SL' after the carburetor number. Master kits contain most of the parts to rebuild the carburetor, including throttle and choke shafts, jets, nozzles etc. Floats are available separately.